This stylish 9ct Yellow Gold & Cubic Zirconia Affinity Bar Ring is a stylish accessory for the fashion forward woman. 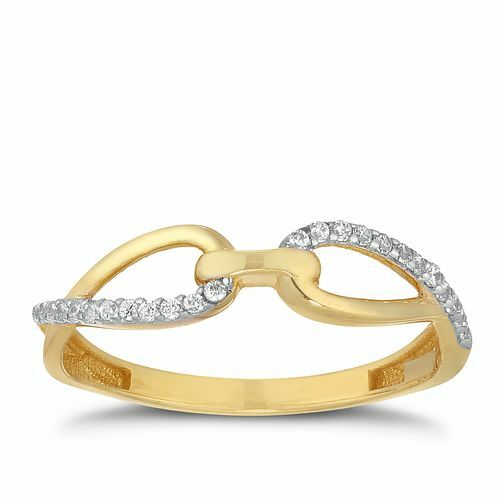 Crafted in yellow gold and silver plating, the intricate design is beautifully adorned with cubic zirconia stones for a sophisticated dazzle. This ring is the perfect accessory to wear alone or as part of a stacking style for a fashion forward look. 9ct Yellow Gold Cubic Zirconia Affinity Bar Ring is rated 1.0 out of 5 by 2. Rated 1 out of 5 by Anonymous from Looks pretty in the photo I purchased this ring as a birthday gift from my children. The photo gives the impression that the ring is more substantial than it actually is. On closer inspection it is very delicate but a pretty design. I only had the ring for just over a week and noticed that a stone had come out at some point. I returned it to the store for a full refund. Rated 1 out of 5 by Anonymous from Dont buy it! I’ve had 2 of these rings an both times ive had stones fall out within a few days of wearing it! Its a beautiful ring but doesnt stay like that.